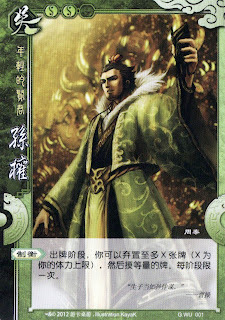 "The Young and Virtuous Ruler 年轻的贤君 (nián qīng dè xián jūn)"
One of "the Three", Sun Quan is the ruler who ultimately formed the Kingdom of Sun Wu 孙吴. He took over the reigns of ruler from his elder brother, Sun Ce 孙策, at the age of 18 and led the Wu Kingdom till his death at 70 years old. He is the longest serving ruler of the era. Compared to Sun Ce who was known as the "Little Conqueror 小霸王", Sun Quan was not as strong a combat fighter, but he was able to win the hearts and respect of his generals and people. He was surrounded with loyal and capable talents, which he prudently retained. The Kingdoms of Sun Wu and Shu Han 蜀汉 formed an alliance to resist Cao Cao 曹操's attacks. However, Sun Quan's short alliance with Liu Bei 刘备 became a sore point as the wits of Sun Wu were no match for the prescient Zhuge Liang 诸葛亮. Regardless, the Kingdom of Sun Wu lasted longer than both Cao Wei 曹魏 and Shu Han. It was the last to be defeated by the Sima 司马 family, which marked the end of the Three Kingdoms era and the beginning of the Jin Dynasty 晋朝. Character ability: "Balance of Power 制衡 (zhì héng)"
During your action phase, you can discard up to X cards (X being your maximum health units), then draw the same number of cards. Limited to once per phase. “Balance of Power” has been weakened. In a single action phase, he can only discard and draw X cards at most, X being his maximum health. His Ruler Ability is removed. "Balance of Power" refers to Sun Quan's decision to ally with Liu Bei so as to counter the immense army of Cao Cao. Before the battle of Red Cliffs 赤壁之战, Cao Cao has already amassed an army far greater than either Shu Han or Sun Wu. With the alliance, both the kingdoms were able to restore the balance of power and prevent a complete runover by Cao Cao.